Caption slip reads: "For Monday. Photographer: Snow. Date: 05-23. Reporter: Petty. Assignment: Baby birds. 18-79: P.E. 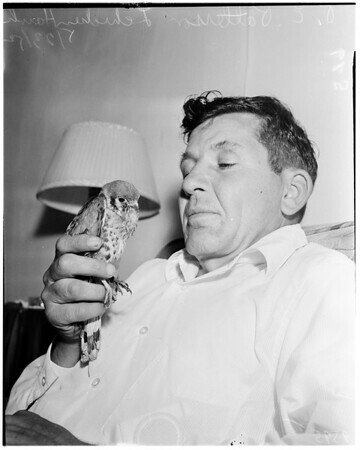 Patterson, 9331 San Miguel Avenue, South Gate, holds baby chicken hawk which he rescued from black birds at Union Stock Yards". Edits: "17: Baby birds in nest at home of Mrs. Frank W. Gunther, 360 South Fetterly Avenue, East Los Angeles".